American students took to the streets to defy gun violence. It was more to defy the those politicians who are financially backed by the National Rifle Association (NRA), the infamous Non-Government Organization (NGO), whose only target is more sales of weapons of destruction, guns and more guns. On March 24, the kids and families of ‘March For Our Lives’ took to the streets of Washington, DC and in 800+ other locations in America. Their message is clear. Theirs is succinct; theirs is angry; theirs is direct and theirs is legitimate and precious. High school students made their case in the court of public opinion. Their rhetoric and the accompanying facial expressions sounded authentic; their determination and devotion to a cause looked stoic; their organizational skills looked almost unreal and the adults who followed them looked even humble and patient. The power of youth was in display most vibrantly and dazzlingly. America’s gun culture definitely took a turn, I hope for the better, that no person of their parent generation thought possible. A sophisticated democracy showed what a sophisticated movement could achieve just in one day. Eight hundred plus rallies all over the United States of America may not have shaken her democracy at her foundations, yet it surely may have sent a series of ripples along a brittle existence of a society bent on ‘safeguarding’ an unsophisticated 2nd Amendment behind which the notorious ‘gun lobby’ is hiding. When youth take up an issue and decide to run with it, it’s unlike a movement or event which are usually organized by adults. Nuanced approaches are ignored; analytical methods are discarded and a direct attack on the base of the issue is being adopted; not-looking-beyond-the-obvious-methodology seems to be paying lucrative dividends. How can Sri Lankan youth be galvanized into action? When were they galvanized last? By whom and for what cause are the questions that need to be answered before we discuss the possibility of sending our schoolchildren and youth below 35 years to a worthy cause. Historically speaking, the Janatha Vimukthi Peramuna (JVP) and its leader Rohana Wijeweera in particular, is one political entity that was both capable in attracting and then unleashing them on a wide scale of violent uprising against the then government of Sirimavo Bandaranaike and her Sri Lanka Freedom Party (SLFP). However, the romanticist allegiance a sizeable segment of our youth in the early 1970s had towards, not necessarily the JVP but more so towards the utterly mythical goals and the development of a social democracy such as Sri Lanka in the ‘70s, cannot be underestimated. Nevertheless, the JVP did not achieve all its successes, not in terms of attaining the goals of overthrowing of a democratically elected government, but in attracting hundreds of thousands of youth towards itself, overnight. A sustained steadfastness to the cause and sacrificing of sweat and blood of the original leaders, especially their leader, Rohana Wijeweera, has been chronicled by many an author and scholar. The magic of youth is that, it does not seem to care for the dangers and obstacles they have to overcome to reach their given goals of the time. Youth with its inherent attraction to adventure and curiosity, seems to get involved in political causes much more easily and emotionally. The sentimental element of hard political facts and looming gloom and doom any socio-political dynamic would leave behind plays a spirited role in that engagement. And the most significant of this engagement is that when the youth or children of a society gets engaged in a political activity, their respective parent generation too gets directly or vicariously keeps their engagement going and this is extremely useful in a democracy where governments are elected and not selected through clannish wars or military coups. The inherent advantage of conversion of youth to a particular point of view is precisely that- conversion of the parent generation through the youth. However, this political strategy cannot work in a vacuum. In this context, the role Ranjit Madduma Bandara, the new Minister of Law Order, is enormous and extremely decisive. He needs to act now and he needs to act fast. What was not done during last two and half years need to get done in the coming three months. I’m sure it can be done if he wants to do it without any interference from high-ups in his government. Ranjit Madduma Bandara can justify his own position as the new Minister of Law and Order and the decision of the government to hand over such an important and pivotal portfolio. To paraphrase Captain Kirk of ‘Star Trek’, Madduma Bandara should go where no Minister has gone before. He should find compelling evidence of all the stories that have been going around the notorious ‘cocktail circuits’, media outlets, street corners, distant hamlets and even among the air-conditioned rooms where the powers that be gather, to buttress and eventually prove beyond a shadow of doubt that the previous First Family and its henchmen and women made unprecedented amounts of illegal money and thereby did untold impairment and harm to our culture. A placid and value-oriented society has been transformed into an unrecognizable conglomeration of individuals who are pursuing money and more money without a care for whose toes they are trampling and whose dentures they are selling to enrich themselves. Then he, Madduma Bandara and the current administration can go to the people, especially the youth who will give no quarter and ask for none, to come forward and ask for their ‘place in the sun’. Castro uttered in his long speeches after overthrowing one of the most corrupt regimes in Cuba’s history, that of Fulgencio Batista, ‘Cuba esta sola’ (Cuba is alone). In the same vein, we can say that today’s youth is alone. They need leadership. We must not let them be led by a fringe organization like the JVP. JVP’s monopoly on youth has to be not just broken, it needs to be shattered. The causes are many and aplenty. Disappearance of Prageeth Ekneligoda; his wife has become a forlorn voice in the current milieu of ‘aggressive indifference’ of a society that is pursuing material wealth and cushy power at the cost of decency and decorum. Lasantha Wickrematunge’s murder is still unsolved case. Rasthupaswala and Katunayake Free Trade Zone murders in broad daylight remain unexplained and our society has chosen to be quiet, once again that ‘aggressive indifference’ which is killing our natural curiosity and intent to go after what is palpably wrong and illegal. A profound sense of quietude has overcome our psyche and the collective mass of people is being led as if nothing has happened during the regime that was run by the Rajapaksas. How on earth, one can forget the ‘White Vans’ and the killing of Tahjudeen? How could any sane person forgive the open brashness of thugs garbed in yellow robes, pretending as if they are pious Monks of Maha Sanga? How on earth one could forget and forgive the untold miseries brought about by these ruffians on untold number of innocent Tamils and Muslims under the cloak of patriotism and devotion for the Dharma? Today’s youth, specifically those who still attend high schools, are completely oblivious of this maddening streak of communal and ethnic discriminations. Their friends ate Tamils, their friends are Muslims and they simply don’t have time, nor the inclination to find out the ethnic background of his next-seat neighbor in the classroom. This the recipe the United National Party must follow. Stuck in a historic disorder of political dilemma, the UNP and its leadership need to rid themselves of their immediate past of two and half years. They must remember that whatever they did during that time has not produced the desired results. It’s time to change, not just its façade; they must do a fundamental change, from top to bottom, not only in their personalities, in their attitude, in their demeanor, in their outlook, in their lock stock and barrel and in their very soul. If not, get ready for a sweeping defeat at the elections to come. 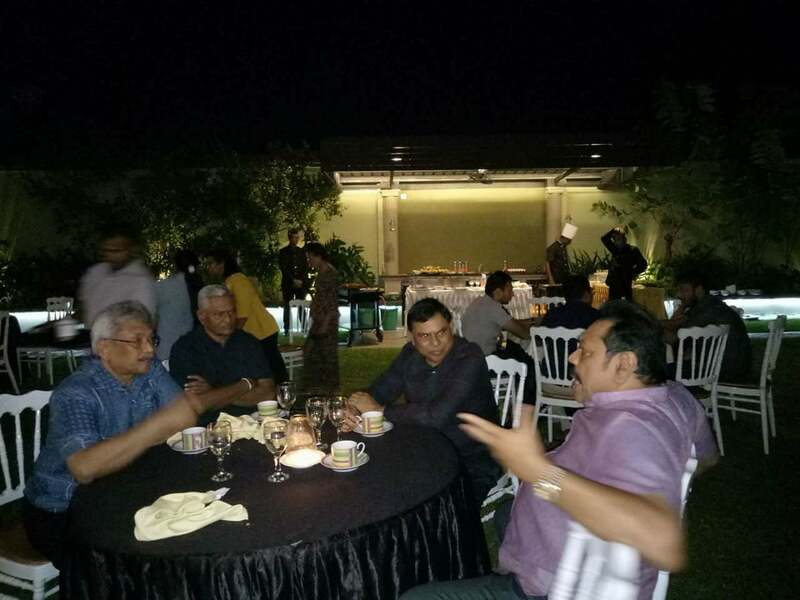 Maithri, Ranil, How Does Your Garden Grow? 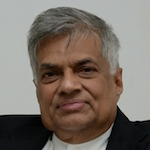 Vishwamithra, ask your masters Ranil hamu, MS, CBK to get their house in order first by first paying back bond money and other public funds looted in this short period of time to the govt treasury……..The shine of Rajapakse bashing has gone………you need to find some new slogans to market………. It is time an American style protest march is organised against 1982 Jaffna library, 1983 Black July and 1989 Bheeshanaya demanding Ranil Wickramasinghe to tender a public apology on behalf of UNP. This is a long overdue historical obligation towards our posterity. Soma, dream on. Vishwamithra will never be critical of the party that enabled him to become very wealthy and he is a blind loyalist to RW like some others. He can never be objective and rational. So he is the UNP’s Dayan J. Ranil Haamu according to him, is the world’s best leader. Apparently he is worthy of a Nobel prize for Economics and Peace too. He defended and covered up for Bondy Mahendran but that does not matter to this writer. Do not be fooled by him. Everyone knows…. Recipe to follow: Go After the Rajapaksas with greater determination. What a brilliant idea. If only this occurred to him before February 10. With friends like Vishvamitra UNP does not need enemies. In short what you say is that the voters should not have their say?? Lol! I think the people now know who the real thieves and traitors are.. as for the white vans and ” killings”.. give us the proof or shut up! You’ve had enough time to show us both the proof and your effectiveness in governance..
You get an F for both! That battle cry has spent itself out as it was built on falsehoods, and fabrications fuelled by anti Sinhala forces. Try working out something else if you want to plunder more. The thievery that has occurred since 2015 does not seem to be enough! Vishwamitra……….. its a little bit too late in the day. Going after the Rajapakshes now is going to hurt him badly. Inform Ranil to resign immediately instead of getting shamed once again before he gets booted out in the NCM on the 4th. Next Premier Karu already in China on an invitation with a team of UNP’ers for a de-briefing. As Word says above, for all your accusations Vishvaamithra, give us proof or shut up. There were million people marches against many things in the west post 2001, has anything changed? No. JVP attracted 100s and thousands of youth twice in the 20th century to drive them to brutal deaths And you Vishvaamithra is asking a youth uprising from the Colombo International School educated folks I suppose..or who else will rise against Rajapakshas after all those blatant lies your masters spread came to nothing. Voters will decide and it is sad if you think a march can bring you Ranil back. If you are an active member of the criminal fraternity or even an aspiring b***s carrier or even a Sinhala/Buddhist fascist it wouldn’t matter whether there exist proof or not would it? However much you kick, scream, bang your head on the nearest wall, defend the clan, ……………… the facts will stubbornly remain facts and truth will be truth. – Buddha the awakened one. Prof Gananath Obeysekere prefers call him awakened one than enlightened soul.